Rick Blythe A & E 2/506 HHC 3rd Bde. Rick was born in New Jersey in 1948 and grew up in Moorestown where his father served as the Rector of Trinity Episcopal Church. In 1959 the family moved to Stratford, Connecticut and in 1960 the family settled in Windsor, New York. Rick’s father was the rector of Zion Episcopal Church and also taught at the local high school. Today, Rick serves as a member of Zion Church’s governing board. (The Vestry). Rick is a 1966 graduate of Windsor High School where he played varsity tennis. He is a 1968 graduate from the State University of New York at Alfred where he also played tennis; and is a 1973 graduate from the State University of New York at Cortland. He’s been with County Government since 1975. 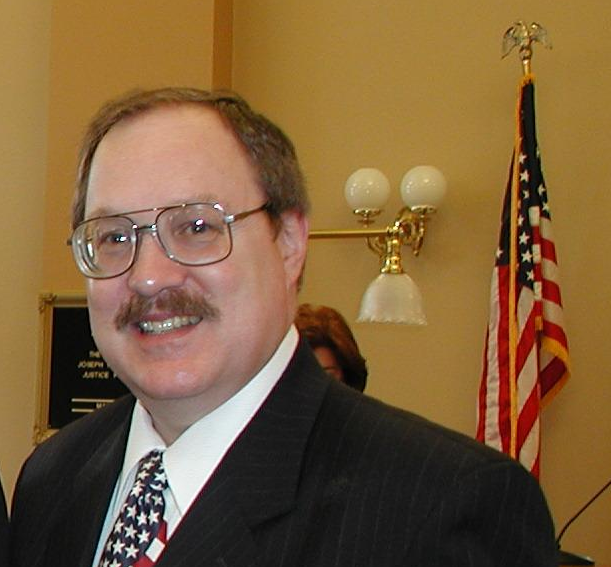 He served 11 years as an County Legislator from Eastern Broome County and has worked in several offices of County Government including: Deputy Commissioner – Board of Elections; Legislative Clerk for the County Legislature; and as Director of Purchasing. He was appointed as County Clerk by Governor Pataki in February of 2005 and surprised many local political observers by winning the 2005 election in spite of being outspent $110,000 to $35,000 by a well known Town Supervisor. He was re-elected in 2009 for a 2nd four year term. His private sector experience includes time at Frito Lay, Windsor Hardware & Home Center and the C.Y. Cushman Construction Company. He’s been involved with several local organizations including the Windsor Medical Center; the Windsor/Kirkwood Dollars for Scholars Program; and the Voice of Democracy Program for Post 2261 of the Veterans of Foreign Wars. He & his wife Michele live in Windsor. They have two children and three grandchildren. My mother was a 1st Sergeant in the Women’s Army Corps during WWII and my uncles also served during WWII so I knew a little about being in the military and military families. Still, my mother was very worried when I was drafted. My father, a very spiritual man did a lot of praying. My brother, a High School Junior was also worried. I had a close friend who went to Canada and it tore his family apart. I never had more than a passing second thought about being drafted or serving. It was part of the rites of passage and it was only years later that I understood the depth of passion of those who went north. I have no ill feelings toward them today. At the time I was drafted, I was working as an Electrical Technician at a General Electric plant in Johnson City, NY. It was a robust job market after college, however on several interviews I was told that my military status would cause a disruption and that I needed to get that behind me. In 1971, while on a job interview with one of the same interviewers from 1968 I was told that my skills had eroded and that I needed to go back to school to refresh my skills – this from the same person that told me to get my military service behind me. My Type A personality came out for an annual appearance. In any event, I enjoyed my time with General Electric having started there in the Fall of 1968. I had just received my security clearance when my draft notice came in early 1969. It was off to Syracuse for induction and then to Ft. Dix for Basic and Infantry Training. While I had shot BB Guns as a boy and perhaps a dozen rounds from an old 22 cal. Rifle, I had little experience with rifles. I amazed myself and my instructors with a Sharpshooter rating with the M-14 followed by an Expert rating with the M-16. Years later while reviewing my military records I was amazed to learn that I had also been awarded the Marksman Badge for the Machine Gun. I didn’t even know we had qualified in that area. 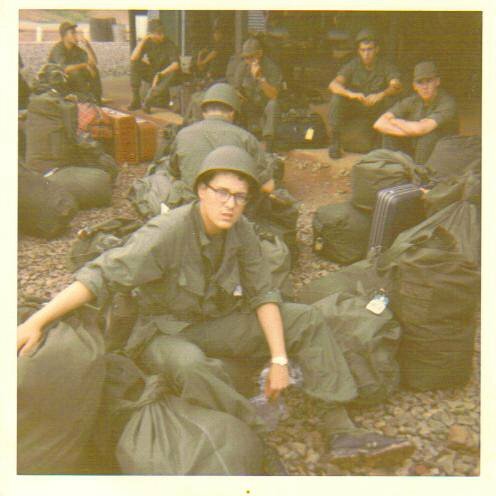 In September of 1969 I flew out of McGuire Air Force Base in New Jersey via San Francisco, via Hawaii, via Guam, and finally landed in Vietnam where we were bussed at night to a replacement holding area. I remember little about the replacement area except that it was always hot. Robin Williams in ‘Good Morning Vietnam’ got it right. At the time I didn’t know much about military history but my parents were proud that I was assigned to the First Infantry Division – the Big Red One. There was a week’s training and then it was off to the field where everything we learned was just a little different. At Ft. Dix we had never flown in helicopters and our practice getting in and out was limited to a stationary model so the first time helicopter experience was both scary and exhilarating as I had a seat on the floor next to the door gunner. Later flights were easier. We were assigned to areas with mathematical names like the Iron Triangle, the trapezoid, and the quadrilateral. If someone ever said rhombus, I think that it would have pushed my squad to ‘pop smoke’ at the announcement. Our patrols were usually in out of the way places and if there was a stream handy we’d walk in it. Even today I’m not fond of camping. I was assigned a machine gun, I think because I could take it apart and put it back together quicker than anyone else in the company. I was also given a 45 cal. pistol. It was from a box of pistols back in the rear area. There were Colts and Brownings and one Ithaca Gun. I took the Ithaca Gun because Ithaca was close to home. I used it a couple of times – it was accurate and easy to shoot. In early 1970 we heard that the 1st Division was going home. We soon learned that that meant that the colors and an honor guard and some of the senior officers were going back to Ft. Riley, Kansas while the rest of us were redeployed to other units. It was very hard to leave friends but a few of us were sent together to the 101st at Phu Bai / Camp Eagle. Now here was a unit I had heard about with both pride and trepidation. My second night waiting to go to my new unit, I decided to go to an outdoor movie, a comedy; IF IT’S TUESDAY – THIS MUST BE BELGIUM.’ Even then I was a Suzanne Pleshette fan but about halfway through the movie tragedy struck as there was an audible shot and a soldier sitting on the same bench as I was about 10-12 feet away was shot and died right there. There was an intense investigation and shakedown but I don’t believe that it was ever solved. I’ve never had the desire to see the movie. Off to Camp Evans and months of a surreal experience. I expected to join my friends with Alpha Co., 2/506 when I was tapped to be the Chaplain’s security personnel of one and the Chaplain’s assistant. Qualifications were a CIB, typing skills, and a military driver’s license. I accompanied Chaplain Fox when he went into the field and for a couple of months shared a billet with him at the rear of the Recruiter’s Building. One night, the door opened and in stepped Black Spade, Col. Lucas. I stood at attention and quickly realized that the conversation between him and Chaplain Fox was strictly for officers. As I shuffled towards the door I received a glance from Col. Lucas to stay put. The upshot of the conversation was that Chaplain Fox was to move to the officer’s quarters – yet to be constructed; and that everyone who wasn’t tied down including Chaplain’s Assistants were to get to Ripcord ASAP. I remember flying out to Ripcord in early morning seeing clouds below the tops of hills and then going in at a very steep angle landing at the base. I remembering filling lots of sandbags and trying to find a place to sleep. The first night was next to a sandbag pile by the artillery unit and I’ll always say thank you to the artilleryman who gave me earplugs. The second day it was raining and I stayed at a covered observation post just under an artillery piece, just down the hill as I recall. The third day it was sandbag duty and about dinner time I was ordered back to Camp Evans. It was still raining and there was some incoming and when we took off we were buffeted so much that to this day I can’t imagine what held us up other than the hand of God. It was simply a terrifying ride. The walk back to the 2/506 in the dark took a long time. At this time I was still staying at the rear of the Reenlistment Building. We had a separate entrance but I needed the key to the padlock from Sgt. Zoeller (?) the reenlistment sergeant to get in. I knocked on his door very late and he thought I wanted to re-enlist. Shortly after, I was transferred to HHC and then later to E Company. After this I had more and more clerical duties which included taking hinges off of ammunition crates to make doors for the officer’s quarters. Assisting in typing sympathy letters was simply gut wrenching and like so many others I have had my share of survivors guilt. One day while at the PX I spotted a civilian male worker taking pictures with a small camera. I followed him a short ways and detained him at the same time I saw an MP vehicle. They found the camera and a very funny looking small pistol. The report of this found its way to the Brigade Chaplain and Chaplain Fox asked me about it some time later as they didn’t know which Chaplain’s Assistant was involved. It just seemed like a good idea at the time. BRONZE STAR MEDAL; ARMY COMMENDATION MEDAL; NATIONAL DEFENSE SERVICE MEDAL; VIETNAM SERVICE MEDAL W/4 BRONZE SERVICE STARS; REPUBLIC OF VIETNAM CAMPAIGN RIBBON; REPUBLIC OF VIETNAM GALLANTRY CROSS W/PALM UNIT CITATION; VIETNAM CIVIL ACTIONS UNIT CITATION; COMBAT INFANTRYMAN BADGE; EXPERT BADGE-M16; SHARPSHOOTER BADGE M-14; MARKSMAN BADGE – Machine Gun; 2 OVERSEAS BARS. I am also a recipient of the New York State Conspicuous Service Cross. Like so many others, I’ll frame them, put them in a closet and remember the real heroes of the 60’s and 70’s. Following my discharge in November of 1970 I returned to college and then taught school for a year. I ran for the office of County Legislator in 1974 and was re-elected 5 times after that. I married someone who could put up with me, a woman who I love very much and this year we will have been together for 40 years. Over the years, the awful memories of Vietnam have faded replaced by a desire to help veterans and families. One of my boyhood friends, Lester R. Stone, Jr. was killed in action in Vietnam shortly before I was drafted. We knew that he had selflessly given his life but didn’t realize that he was to become a posthumous recipient of the Medal of Honor. 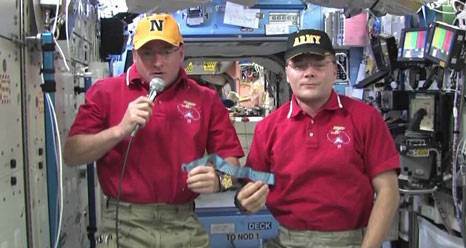 International Space Station Expedition 25 crew commander Doug Wheelock (right) and Flight Engineer Scott Kelly hold the Congressional Medal of Honor that was awarded to Sgt. Lester R. Stone Jr. during a Nov. 10, 2010 video recorded in honor of Veteran’s Day. I am excited about the upcoming video and was honored to be able to pledge to help the project along. As County Clerk, I also run the local Motor Vehicle Offices and I have a special outreach program for free license plates for Gold Star Mothers anywhere in New York State and I assist veterans who want special veterans related plates in slicing through the NYS bureaucracy to obtain one. I was at the first Ripcord related reunion and the fifteenth. The reunions occur during the time my governmental budget is up for review. Now, approaching retirement age I hope to be able to attend more in the future; or as my wife says – to travel with her. My best to all – CURRAHEE.